Info "‘That’s low of you to strike while Samurai Wario is sleeping! Little do you know that I sleep with one eye open! Bwahaha!! !’"
Three's a Crowd is one of Tiny Wario's Microgames in WarioWare: Smooth Moves. Its name comes from the phrase "two is company, three is a crowd." The objective is to wait for the ninja to come, and then jolt up the Wii Remote to slash him. 1st level difficulty: The ninja will drop in. When he is slashed, his suit will fall off, revealing heart-print boxers. 2nd level difficulty: The ninja fakes then drops in. When the ninja is slashed, he will have white briefs. 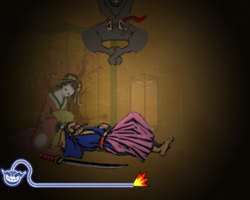 3rd level difficulty: A servant may appear to distract the player, or the servant may be the ninja in disguise. When the ninja is slashed, he will have pink briefs. The minigame in the Korean version. In the Korean version of the game, due to cultural differences, some aspects have changed. Wario retains his normal outfit, the ninja is replaced by a monkey and the background has changed to a jungle. 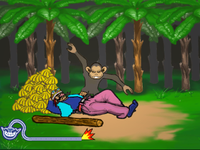 Wario must wait for the incoming monkey and whack it before it gets all the banana bunches. This page was last edited on March 25, 2018, at 12:40.